So we sat there by the side of the river, the ape, the chimp, the horus and the rest of us, and talked about the games we'd create to make the world a better place. The scene: Hamlet Linden's riverside office in Waterhead. The players: Harmony Harbinger, numerous Residents interested in the contest, & yrs. trly. So Harmony, want to talk a little about the contest? Harmony Harbinger: Yes, let's! The deadline is March 1, 2006. Then we plan to announce the finalist April 1 or thereabouts, and then flying the finalist out to Los Angeles, May 8. Hamlet Linden: Sweet, right during E3. Harmony Harbinger: Exactly! Hoping to get comped tickets for the winners as well. Well, for all the finalists (crossing fingers). Hamlet Linden: Are there game publishers involved in sponsoring this? Harmony Harbinger: Bing Gordon from Electronic Arts is one of our judges at the moment. As far as sponsorship, I will hold have hold off for a little bit before I make an official comment on that. Hamlet Linden: I might have missed this, but is it possible to submit an entry as a group? Harmony Harbinger: Yes it is-- in fact we are expecting that. And expect to fly out the [winning] group as well, not a huge group but 2-3 per entry if it is a group effort. Elle Pollack: Are you guys looking specifically for video games? Specifically, can more traditional card or board games be submitted, or would it have to be a computerized card/board game? Harmony Harbinger: We're looking for computerized games, but realize we can get everything from a true prototype to a Shockwave file. Elle Pollack: Harmony, Are there any books or other reading material you'd recommend for learning about the subject of public diplomacy? Harmony Harbinger: Hmmm.... I would definitely check out our website, the general one. But I would also look up [Joseph Nye's] “soft power” as a key term. jamie Martin: Who will control the rights to the project? Harmony Harbinger: The creator, and if it's a mod, partly the original publisher of course. Hamlet Linden: So what are examples of current or past games that are in the realm of what you guys are looking for? Harmony Harbinger: Hmm.... well that's the trick, I don't think there's an obvious example. I think it will be a sort of amalgamation of MMOGs and maybe Civilizations or Rise of Nations. The concept came from [Star Wars] Galaxies originally. This idea that the ability to communicate across cultures and nations via a virtual world is the inspiration. So in a way that's what we're looking for, something that allows for a virtual exchange program. jesz Murakami: I assume you're wanting a cooperative rather'n competitive game. Intimacy rather'n alienation. Kanker Greenacre: Have you guys tossed ideas among yourselves? Harmony Harbinger: Hmmm... well let's see, I can tell you about an experiment I'm working on, that might help with ideas? So my experiment. I had figured that if I were to ask the public to submit something like this, I should go through the process to a certain extent myself. Or if anything the "after" process. So I tried to break down what counted as "public diplomacy" within a virtual world-- and well, I'm still working on it. I have a blog at the contest website which will hold my research later. I'm looking to observe an American class and a German class interact within a virtual space (SL) and accomplish a goal together. And with surveying and post interviews track whether there was a image change. Or an interest change in regards to the other country. Mallaien Massiel: I have witnessed this effect a lot, and there are ongoing discussions as more and more people play the same online games. And what I'm hoping is to be able to establish a type of experiment where we can say, yes, this does help image perception and interest and therefore public diplomacy. Harmony Harbinger: Exactly Mallaien! Also about the submission. I'd like to stress we're looking for a really good idea, and understand that implementation can be difficult. jesz Murakami: "Public diplomacy" --- what is the goal? Harmony Harbinger: Well to me it's the ability to promote intercultural communication. International understanding. Non-violent conflict. jamie Martin: But intercultural communication does not always lead to actual understanding. Quite often it leads to conflict. Harmony Harbinger: True, but the ability to communicate through that conflict is the goal. And make it to the other end unscathed hopefully. Elle Pollack: So you're looking for a game that promotes public diplomacy moreso than they're looking for a game about public diplomacy? jesz Murakami: So this game should have assured rather'n assumed communication. Harmony Harbinger: I think the competition could encompass a game that promotes public diplomacy as well as one about public diplomacy, to Elle's point. We don't want to narrow it down so much. As well as assured over assumed communication, as jesz mentioned-- I would say whichever proved or could be argued to be more effective. But understanding that maybe the best mechanic will hold one characteristic stronger than the other. Mallaien Massiel: I would think that a majority of people playing American game products assume that everyone will speak English. Harmony Harbinger: That's something I want to explore as well. How many non-native English speakers play with English speakers. Hamlet Linden: That could be cool, a game where you have to work with non-English speakers by using building tools to illustrate what you're trying to talk about. Mallaien Massiel: I have come to understand that communication isn't so much the key to perception, its the difference in the culture that adjusts people perceptions and it's the interaction that brings the cultures together and changes the perceptions. jesz Murakami: Yes, Mall---but when people speak a same language, like English, they assume it's a language rather'n the medium for each personal language. Mallaien Massiel: Yeah, there is a cultural binding on that; a lot of Americans will spend more virtual cash on something that makes then unique than others would for character abilities. Vincent Doctorow: Appearance, I would say, runs most of the economy here in our little SL world. There is so much control over appearance that I'm almost intimidated by it. Mallaien Massiel: I have been on Second Life only two weeks and I have all too well learned on the way appearance drives interaction here. Vincent Doctorow: [I] read somewhere that Chinese MMORPGs tend to have lesser ability to control the appearance of your avatar. But American MMORPGs let you go bonkers with the way your avatar looks. Harmony Harbinger: I remember when it was a big deal at Lucas[Arts] that you could make your avatar look Asian with a fold in the eyes. Hamlet Linden: That might be an interesting game in itself-- each player takes on different racial characteristics, and the other players have to see if they can guess real life ethnicity beyond that. Vincent Doctorow: Haha... that reminds me of a website that was themed "guess the Asian" and they showed you pictures of Koreans, Chinese, and Japanese and you had to guess what ethnicity they were. I totally failed. In the end I guessed based on what they were wearing, not their biological features. Harmony Harbinger: Aahh! What do you all think my background is? Vincent Doctorow: Based on your avatar’s appearance? Harmony Harbinger: Just for fun... yeah! jesz Murakami: Newbie, based on appearance. Vincent Doctorow: I'd guess... Southern or Eastern Europe. Dark skin, but you don't have Asian eyes. jamie Martin: I'm guessing your of Asian descent. For no particular reason. You're, I'd say, Inuit. Harmony Harbinger: Well for the curious, half Chinese, half German. Vincent Doctorow: Speaking of ethnicities, here's a monkey! Hamlet Linden: Hi Fly, have a seat. Or sit on the ground and pick at fleas, as you prefer. No throwing poop, however, we have strict rules there. Hamlet Linden: So does anyone want to talk about a game idea they have for this contest? Harmony Harbinger: It's a great opportunity I think to showcase people's work, ESPECIALLY if they want to be a designer. Hamlet Linden: And Cory Linden is a judge, too, remember. Risk-style board/card games...scaled to a large city or small country-- fictionalized, but not dissimilar to the state of Iraq or Israel, having two or more polarized factions occupying it. Harmony Harbinger: Elle-- keep going with it, also there's a game in the works by Carnegie Mellon called Peacemaker which might be an inspiration about the Israeli-Palestinian conflict. And I like the gain influence part. jamie Martin: I was thinking of abstracting things a bit, based on my impression from this meeting. Say each side plays a race that communicates very differently, and has different strengths. The effort of bridging the communication gap and exchanging memes would increase your combined abilities. Vincent Doctorow: An interesting public diplomacy game would test how differing nations and cultures would react to a threat that is greater than their individual conflicts, like an asteroid impact. Cooperation in apocalypse scenario. Harmony Harbinger: Totally. Well, it's what people often say will truly bring world peace, when something greater than the world threatens us. 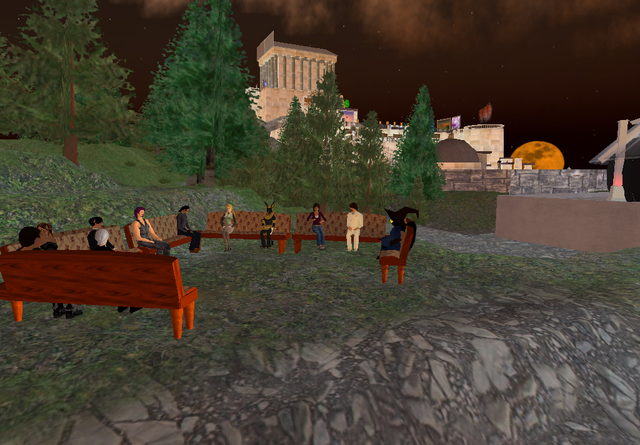 Hamlet Linden: Harmony, would a game that includes violent conflict be precluded? Or can it have that as a gameplay mechanic as long as it leads to some kind of eventual, well, harmony? Harmony Harbinger [laughs]: You know I think it could involve violence but you'll have to justify it. If you pitch it as a stepping stone... also, public diplomacy, well one goal of it at least, is to ultimately prevent violence. Vincent Doctorow: Just like Elle's game, based on the Iraq/Israel thing... because if it's based off of that part of the world, half of the politics is trying to decrease the violence. jamie Martin: I guess the question is how do you show the benefits of diplomacy without giving violence at least some credit. Violence isn't optimal for the world at large, but it often benefits one group quite well. 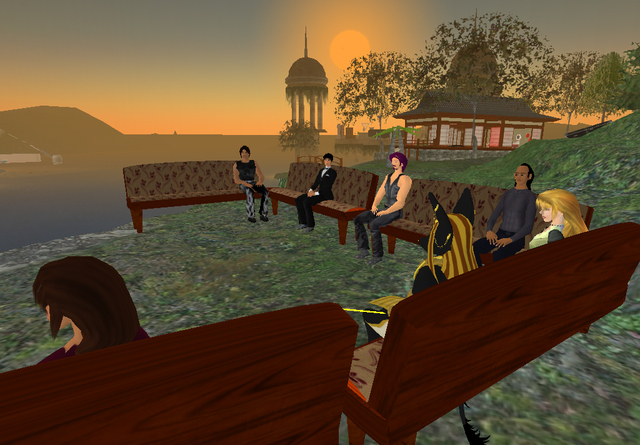 Hamlet Linden: All I would say speaking for myself is don't underestimate how complicated creating a game in here is. Last two [game] contests (the Linden-run ones) folks had some really great ideas, but occasionally bit off way more than they could chew. With Harmony's contest, it seems like they're more interested in the idea than the execution, though, so you may wanna shoot for the basic gameplay, getting that down, as opposed to all the pretty bells and whistles. Vincent Doctorow: My mom always got mad at me for playing video games too much, now I can show her contests like these. See mom, I really am making a difference. Harmony Harbinger [grinning]: Hell yeah. Thanks everyone for coming! And please feel free to contact me offline or in world if you have any more questions. My fave part of this was the nod to ALL LOOK SAME... what was funny was I was expecting that, like a well-worn punchline. Something about Harmony Harbinger's av reminds me of Skyllar Skidoo's, and I don't think it's just the alliteration. Something that also grabbed me were websites discussing different negotiating tactics around the world. Cultural differences and strategies used in groups. It's like, if you want to make a deal with me, come to my house and bring a watermelon. I think a good start would be to have the whole web pages of second life translated in the 5 most spoken languages..... That would remind the american people of the other countries and wouldn't let english language as much granted as it is now. I think what's more important than worrying about what language the players speak, is where they're from. I mean, is there a head-count on the number sl residents from the mid-east, africa etc? My guess is this number is fairly low. Not only is their access to connections that can handle SL limited, but I also think these people are also much more averse to using credit card numbers on the web (assuming they have credit cards --since many of the fast connections are through universities, so students, grads etc). So the whole "game *as* public diplomacy" angle may be rather limited. This definitely sounds intriguing... I have an idea for a game; just have to kick the tires a bit and tweak the rules; I can't program for crap, but I can easily come up with a framework and go from there.